Tender, fall-apart, juicy Slow Cooker Italian Pot Roast recipe is packed with flavor and an easy weeknight dinner. It’s fancy enough to serve to dinner guests for a holiday meal and the crock pot does all the work! Nothing beats a good pot roast in the fall and winter. It is such great comfort food and really just hits the spot. My Crock Pot Coca-Cola Roast was one of the first recipes I posted on this blog years ago and remains so popular. This is an extremely scrumptious pot roast I’m sharing with you today that you can serve at your Christmas dinner over mashed potatoes and have your guests absolutely love it. This Slow Cooker Italian Pot Roast is on repeat on my house and I think you will love it just as much as my family does. This pot roast is extremely budget-friendly, but fancy at the same time. I love a roast like that! If you’re looking to make an amazing beef roast for the holidays but don’t necessarily want to splurge on a prime rib or beef tenderloin, this one is for you! If roasts intimidate you, this roast is very attainable, even for beginner cooks. It is very simple to just throw together in the morning and results in a tender fall-apart roast hours later with an incredible flavor! I love cooking with my slow cooker because I get the “work” out of the way early on and then can move on to the other tasks I have to get done that day. I would use it every day if I could! 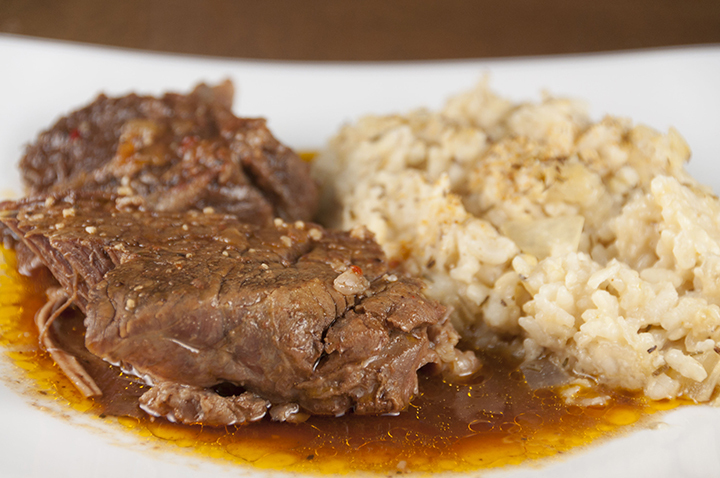 What made this pot roast even better was using a Moyer beef chuck roast. I’ve been using their quality beef in a lot of recipes lately and I am always happy with how my beef dishes turn out. Choosing a good cut of beef really enhances the flavor of your meals like nothing else. If you haven’t tried Moyer beef yet, I encourage you to do so. Moyer beef is available in USDA Prime and Choice and you can always feel confident that buying their beef is helping to support local communities and farmers. That is a good feeling! 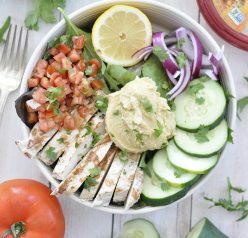 Their business is rooted in partnerships with more than 4,000 small family-owned farms across the northeast area! In case you are not familiar with different beef cuts, the chuck roast is a thick cut of meat that comes from the muscle between the neck and shoulder blade of a cow. It’s a relatively inexpensive cut, has a rich flavor, and is perfect for slow cooking as this breaks down the collagen and tenderizes the meat. As the chuck roast slow cooks, it is given enough time for the meat to soften and become very juicy. 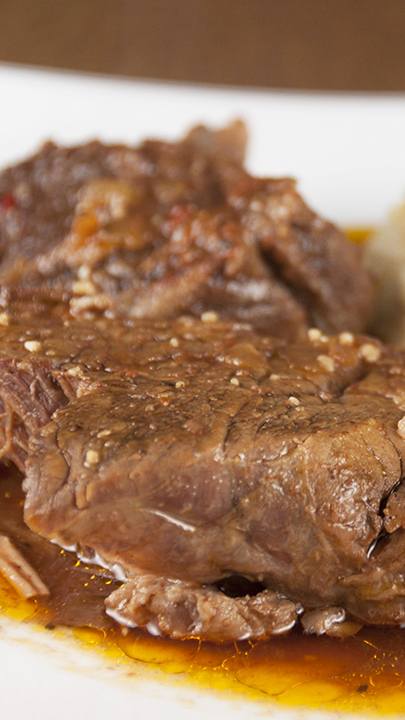 This Slow Cooker Italian Pot Roast cooks in a delicious tomato-based sauce, Italian seasonings, and Au Jix seasoning. The flavor is like a party in your mouth and even better when you serve it over my Slow Cooker Buttery Garlic Mashed Potatoes. 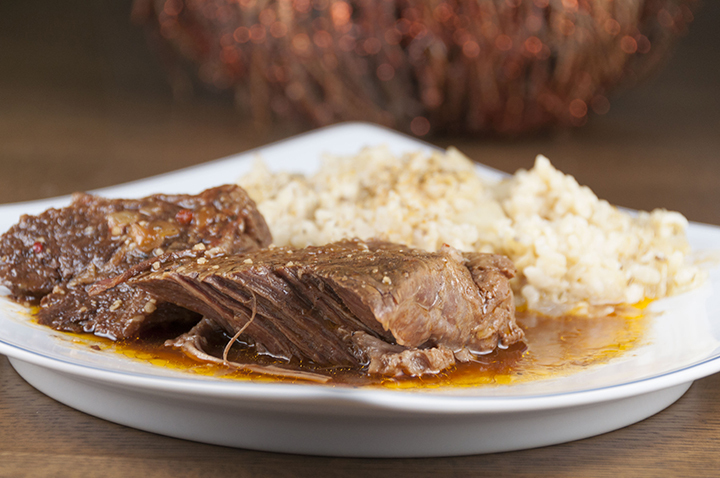 Well, look at that – your entire meal can be done in the slow cooker if you happen to have two. Enjoy and happy cooking! 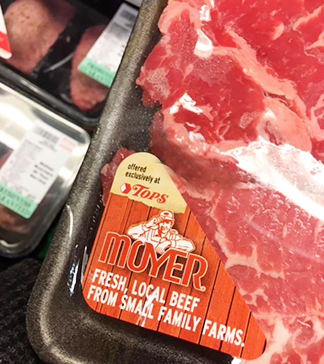 If you are interested in finding out where the nearest store is that you can purchase Moyer beef, be sure to visit their store locator. Here is my “how to” video with step-by-step instructions on how to make this Slow Cooker Italian Pot Roast! 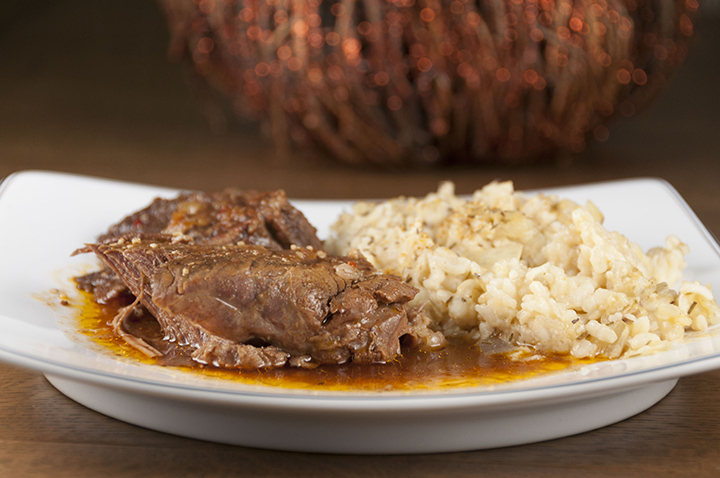 Slow Cooker Italian Pot Roast recipe is packed with flavor and an easy weeknight dinner. It's fancy enough to serve to dinner guests for a holiday meal! Place roast in the bottom of your slow cooker/crock pot. Whisk the remaining ingredients together in a separate bowl and pour over the roast. Cook on LOW for 8-10 hours or on HIGH for about 4-1/2 hours. Serve over risotto or mashed potatoes. Enjoy! I just got a new programmable crock pot so now I can make gorgeous roasts like these without burning them! (I had a cheapo one that I had to manually turn the knob for) Hooray! I actually make an Italian Pot Roast quite often! It is my daughter’s favorite meal that I make for her. But, I use a bit of different ingredients. I do have to agree, you must start with a great cut of meat! I have never made pot roast before but I am willing to give it a go. 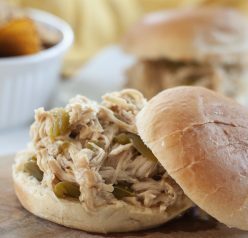 I am always looking for new ways to use my slow cooker so this is my recipe for next week. 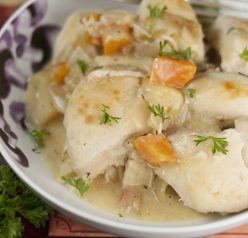 I love slow cooker recipes, and I am looking for new ones all the time. I have never made a pot roast in the slow cooker, but I want to try. I will grab a roast at the store this week. I love a good crockpot recipe, in fact I am using mine right now to cook our Chilli dinner for tonight. I would love to try this recipe out too. It looks really good although we don’t really buy too much beef because my husband is a hunter so we use venison all year long but this looks so good, I may pick some up. This pot roast looks so moist and juicy. I’ll have to admit that I’ve never made one before but I enjoy eating it 🙂 If Santa comes through for me, I just might make this as meal soon! Oh Thanks dear for this. I am trying to find new recipes to try on and this sounds a great one for Christmas to serve on our table. I have heard about using coca cola in cooking different meat dishes in the past, but this does look amazing. I love how tender the meat looks. And I am surpised how good that looks being cooked in a slow cooker. Seems like a great holiday meal! I’m vegan, so i won’t be able to eat this, but I do have non vegan friends and family that would appreciate this recipe. Thanks for sharing! Can you use different cuts of meat and get the great taste? My favorite is a London Broil, and wondered if this recipe would work good with it also. Love your great ideas!! Thanks Tammy! I imagine it would work with other cuts. I love London broil! As long as it’s good cooked in a crock Pot I would say it would still work great!